F Radek Duda (Regina, Lethbridge, 1998-2000) has signed a two-year extension with Karlovy Vary (Czech Republic, Extraliga). This season, as team captain, he had 19 goals and 17 assists in 46 games. There now are three WHL teams without head coaches. The Kootenay Ice joined the fray on Wednesday with the announcement that it won’t be renewing head coach Ryan McGill’s contract when it expires on June 30. “At this time, we feel we need a fresh face and voice moving forward to lead our team,” Jeff Chynoweth, the Ice’s president and general manager, said in a news release. The Ice will be an awfully young team next season, so Chynoweth told Taking Note that a decision was made to find a new voice. “Just looking at what we are losing this year, in terms of players, and how much of a step back I think we are going to take next (season) with a young and unproven team,” Chynoweth told Taking Note via text. The Ice’s roster includes 11 players born in 1995 and three who were born in 1994. F Sam Reinhart isn’t expected back, while F Tim Bozon, F Austin Vetterl and F Levi Cable used up their junior eligibility. McGill, 46, is from Sherwood Park, Alta. This was McGill’s second stint as the Ice’s head coach. He was in his third season this time around; he also was head coach 1997-2002. In total, his record is 280-222-53. 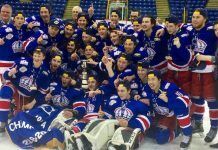 Under McGill, the Ice won the WHL championship in 1999-2000 and 2001-02, and the Memorial Cup in the spring of 2002. Between his two tours of duty with the Ice, McGill was an AHL head coach for seven seasons and an assist with the NHL’s Calgayr Flames for two seasons. The Ice went 37-31-4 this season to finish fourth in the Central Division and earn the Eastern Conference’s first wild-card berth. The Ice then lost a first-round series in seven games to the Calgary Hitmen. You have to think that McGill will wait and see if any pro offers come his way before he decides on his next move. 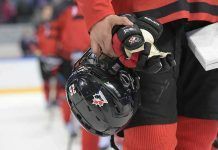 Along with the Ice, the Lethbridge Hurricanes and Vancouver Giants also are without head coaches. Peter Anholt, who stepped in as GM and head coach in Lethbridge in mid-season, has said he won’t be back as head coach and will be hiring. In Vancouver, the Giants parted company with Claude Noel at season’s end. Noel also had been a mid-season replacement. Last off-season, 10 of the WHL’s 22 teams made coaching changes. In Regina, F Tanner Kaspick scored at 3:36 of OT to give the Brandon Wheat Kings a 3-2 victory over the Pats. . . . The Wheat Kings lead the series, 3-1. Game 5 is scheduled for Brandon on Friday. . . . Kaspick, who is from Brandon, scored his first WHL playoff goal. 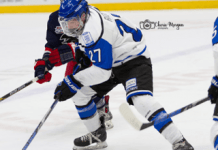 He had one goal in 53 regular-season games. . . . Kaspick turned 17 on Jan. 28. . . . Regina D Connor Hobbs was hit with a kneeing major and game misconduct for a hit on Regina D Ryan Pilon at 7:22 of the third period. . . . Pilon needed help leaving the ice. . . . Brandon scored once on the ensuing PP as F Peter Quenneville scored his third goal at 7:53. That tied the score 2-2. . . . Hobbs had scored Regina’s second goal, at 6:27 of the second, on a PP. . . . Brandon F Nolan Patrick scored the game’s first goal, his second, at 19:37 of the first period. . . . Regina D Colby Williams came out of the penalty box, took a breakaway pass from F Pavel Padakin and went into to score his third goal at 4:27 of the second. . . . Brandon G Jordan Papirny stopped 30 shots, 15 fewer than Regina’s Daniel Wapple. . . . Brandon was 1-for-4 on the PP; Regina was 1-for-3. . . . Earlier in the game, Brandon F Mark Matsuba (headshot) and D Ivan Provorov (boarding) were given minor penalties for fouls the Pats felt could have been majors. . . . “It’s tough but it is what it is,” Wapple told Greg Harder of the Regina Leader-Post. “We can’t point fingers but at the same time there were a couple hits that definitely could have been more than a two-minute penalty and ours is a five-minute penalty. It is what it is. You can’t do anything about it now.” . 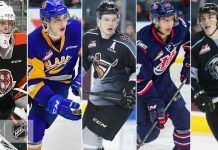 . . Regina head coach John Paddock offered:“Clearly to us Provorov should not have been in the game and clearly (Tuesday) night Reid Duke shouldn’t have been in the game (after a cross-check to Adam Brooks). Those are things we have to deal with. You have to find a way. We found a way. We played good enough to win.” . . . Regina again was without D Sergey Zborovsky, who is serving a three-game suspension for a hit on Brandon F Jayce Hawryluk in Game 2. Zborovsky had his suspension set at three games on Wednesday, meaning he will be eligible to return for Game 6. . . . Hawryluk hasn’t played since being hit by Zborovsky, who took an interference major and game misconduct on the play. . . . Attendance was 5,161. . . . The Wheat Kings have played five road games in these playoffs and each of them has ended in a 3-2 score. Brandon is 4-1 in those games. Two of them have gone to OT and Brandon has won both. . . . BTW, F Jesse Gabrielle had been credited with the game-winning goal in Regina’s 3-2 victory on Tuesday night. Sometime after that game, it was changed to F Taylor Cooper. Both are former Wheat Kings. In Medicine Hat, F Jordy Stallard scored at 7:22 of OT to give the Calgary Hitmen a 2-1 victory over the Tigers. . . . 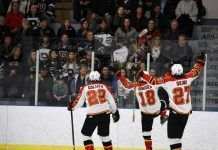 The Hitmen lead the series 3-1 with Game 5 scheduled for Friday in Calgary. . . . Should Calgary win on Friday, last night’s game will have been the last one for the Tigers in the Arena. They will move into the Regional Event Centre next season. . . . Interestingly, attendance was 3,518 — not the usual 4,006. . . . Stallard, like Kaspick, is from Brandon. Stallard, 17, had six goals in 58 regular-season games; he has three goals in these playoffs. . . . Tigers D Ty Lewington scored the game’s first goal, his first, at 19:41 of the first period on a PP. . . . Calgary tied it when F Jake Virtanen scored his second goal, on a penalty shot, at 6:24 of the second. . . . Calgary F Elliott Peterson was awarded a penalty shot just 29 seconds after Virtanen’s goal. Peterson, however, lost control of the puck and wasn’t able to get off a shot. . . . Calgary G Mack Shields turned aside 35 shots, while Medicine Hat’s Marek Langhamer kicked out 20. . . . The Tigers had a 14-3 edge on shots in the third and 6-2 in OT. . . . Medicine Hat was 1-for-5 on the PP; Calgary was 0-for-1. . . . F Adam Tambellini, the WHL’s leading playoff scorer, was among Calgary’s scratches. He has an undisclosed injury. The Hitmen continue to be without D Jake Bean and F Chase Lang. . . . The Tigers had F Chad Butcher (broken thumb) back after a five-game absence. As a result of his return, F Mark Rassell was scratched. . . . Laurence Heinen wrote this game story right here for the Calgary Herald. In Victoria, F Greg Chase scored at 5:30 of OT as the Royals stayed alive with a 5-4 victory over the Kelowna Rockets. . . . Kelowna, which had won its first seven playoff games, holds a 3-1 edge in the series, with Game 5 scheduled for Kelowna on Friday night. . . . Chase has seven goals in these playoffs. . . . The Rockets had 2-0, 3-1 and 4-2 leads before the Royals tied it with goals 24 seconds part in the third period. . . . F Jack Walker scored his second goal of the game and third of the playoffs at 10:42 and F Brandon Magee got his WHL-leading ninth goal at 11:06. . . . D Lucas Johansen, with his first goal, and F Tyson Baillie, with his sixth, gave the Rockets a 2-0 first-period lead. . . . Victoria F Austin Carroll got his first goal at 17:47 to cut into the lead, but Kelowna F Rourke Chartier, with his sixth, got that one back 26 seconds later. . . . Walker and Kelowna F Tomas Soustal traded second-period goals. . . . Soustal, who had eight goals in 65 regular-season games, has four in eight playoff games. . . . Kelowna went 0-for-8 on the PP, including a chance in OT after Magee was penalized for goaltending interference at 0:18. . . . Victoria G Justin Paulic stopped 36 shots, 10 more than Kelowna’s Jackson Whistle. . . . The Royals were 0-for-3 on the PP. . . . F Alex Forsberg had two assists for Victoria, including one on the winner. . . . Kelowna F Nick Merkley wasn’t able to score on a penalty shot at 4:29 of the second period, with his side ahead 3-1. . . . Attendance was 4,909. There has been an interesting development in Regina where a company that is owned by co-owners of the Pats has registered a builders’ lien against the team’s landlords, the Regina Exhibition Association. It all has to do with work done installing the Brandt Centre’s score clock earlier this season. . . . Austin M. Davis of the Regina Leader-Post has the story right here. Mike Stothers, who spent the previous three seasons as head coach of the Moose Jaw Warriors, is the AHL’s coach of the year. Stothers, 53, left the Warriors prior to this season to take over as head coach of the Manchester Monarchs, the AHL affiliate of the NHL’s Los Angeles Kings. . . . With three games still to play, the Monarchs are 48-16-6-3. They will go into the playoffs as the Eastern Conference’s top seed. . . . The AHL award is voted on by coaches and media members in each of the league’s 30 cities.